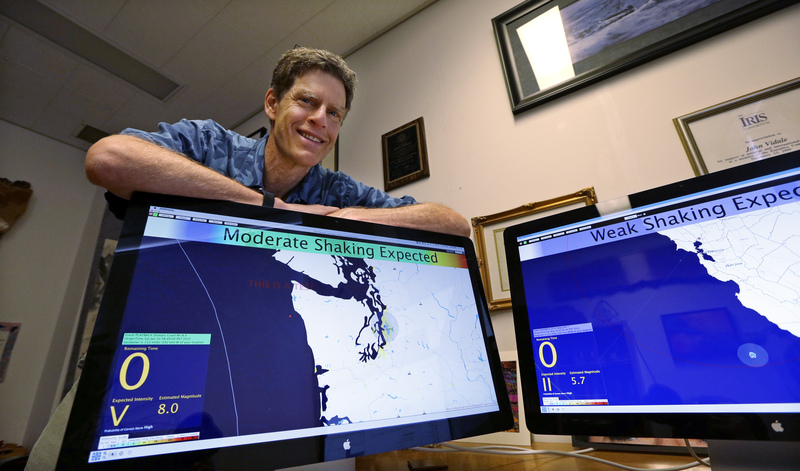 University of Washington researchers are testing an earthquake alert system as the Pacific Northwest prepares for the day when a 600-mile-long fault line looming off the coast unleashes a catastrophic earthquake and tsunami. The fault line hasn't produced a major quake since 1700, but seismologists say one could happen in our lifetimes. Is a massive earthquake in Pacific Northwest "overdue"? Fears of such a quake - heightened after the devastating 2011 Japanese temblor - have fueled the development of the computer alert system that officials hope will save lives and protect critical infrastructure by giving a precious heads-up to get ready. The alerts are now going to companies such as Boeing and Microsoft as well as hospitals, utilities and emergency management agencies in Oregon, Washington and British Columbia, who are beginning to think about how they would respond. "Any advance warning would be helpful - even as little as 10 seconds," said Carmen Merlo, director of the Bureau of Emergency Management in Portland, Oregon, among the places that could be devastated when a mega-quake hits. Her agency is among those testing ShakeAlert, which sends out warnings that tell recipients when a temblor is developing and, depending on the depth, strength and distance from the epicenter, calculates how much time before the jolt will hit their location. The system has used smaller quakes to create its alerts. That's good, because some bugs are still being worked out of the warning system and it's not quite ready for implementation, say UW researchers. When it is up and running, alerts could let motorists avoid bridges that may collapse, automatically open fire department bay doors so they aren't jammed shut during the coming quake, shut off natural gas lines, power up emergency generators, and shut down machinery at manufacturing plants, to name just a few examples. Development of the system comes amid growing worry about a slumbering beast called the Cascadia Subduction Zone: a fault stretching from northern California to Vancouver Island that separates the Juan de Fuca and North America tectonic plates. The Juan de Fuca plate is being shoved beneath the North America plate, creating strains that will eventually be released in a large earthquake that will also produce a tsunami. Concerns about the looming danger offshore have grown after quakes and tsunamis in the Indian Ocean in 2004 and in Japan in 2011. The seismic threat was underscored in a recent New Yorker article titled "The Really Big One." A 2013 report by a panel of Oregon experts also spelled out the potential disaster. The report said a 9.0-magnitude Cascadia quake and tsunami might result in several thousand deaths in Oregon alone, tens of thousands of buildings destroyed or badly damaged, coastal communities decimated, bridges snapped, transmission towers toppled, landslides, explosions and economic losses of more than $32 billion. There is broad scientific consensus that Cascadia mega-quakes as large as magnitude 9.0 have occurred on average every 500 years. But seismologists say one could occur at any time. As its devastating potential becomes clearer, greater steps are being taken to protect life and property. Some coastal communities have placed caches of food and other supplies on high ground in case of evacuation. New maps have been drawn up showing areas likely to be inundated by a tsunami. Schools are getting seismic retrofits. Part of the effort, ShakeAlert uses hundreds of seismic sensors around the Pacific Northwest to detect harmless, fast-moving signals - called "p" waves - that precede the "s" waves that create violent shaking in an earthquake. Data from the sensors are sent to a computer at UW, where the signals are analyzed and alerts generated on ShakeAlert software that has been distributed to the system's testers. ShakeAlert is being developed by the U.S. Geological Survey in partnership with university researchers. Testing began in California in 2012 and was extended to Oregon and Washington state last February. Japan has a similar alert network, and it was credited with saving lives in the 2011 disaster. The system got a real-life test in a 6.0 earthquake that rocked California's wine country in August 2014. The alert was sent to ShakeAlert testing agencies, including Bay Area Rapid Transit (BART) in the San Francisco Bay area, about 50 miles south of Napa. Trains weren't running when the quake struck, but had they been an automatic trigger would have slowed them down to lessen the risk of derailment. The USGS and its university partners are using $4 million in funding approved by Congress to build out the existing network and improve its speed and reliability. Architects of the system say it could be completed within three years with increased funding. "This is proven technology," said Douglas R. Toomey, a University of Oregon professor of geophysics and this state's point person on ShakeAlert. "We would like to build it before the next large earthquake." But it's not just money that's needed. So is education about how to react when that earthquake alarm goes off. "Even if you put the signal out, if people don't know what to do with it it's not going to help you," said Mark Ghilarducci, director of California Emergency Services.